This concern, detailed below, is hardly conventional wisdom. Many economists and commentators do not think it makes sense to worry about inflation right now. After all, inflation declined during the financial crisis and subsequent recession, and remains low by post-war standards. The yields on long-term Treasury bonds, which should rise when investors see inflation ahead, are at half-century low points. And the Federal Reserve tells us not to worry: For example, in a statement last August, the Federal Open Market Committee noted that "measures of underlying inflation have trended lower in recent quarters and, with substantial resource slack continuing to restrain cost pressures and longer-term inflation expectations stable, inflation is likely to be subdued for some time." But the Fed's view that inflation happens only during booms is too narrow, based on just one interpretation of America's exceptional post-war experience. It overlooks, for instance, the stagflation of the 1970s, when inflation broke out despite "resource slack" and the apparent "stability" of expectations. In 1977, the economy was also recovering from a recession, and inflation had fallen from 12% to 5% in just two years. The Fed expected further moderation, and surveys and long-term interest rates did not point to expectations of higher inflation. The unemployment rate had slowly declined from 9% to 7%, and then as now the conventional wisdom said it could be further lowered through more "stimulus." By 1980, however, inflation had climbed back up to 14.5% while unemployment also rose, peaking at 11%. Over the broad sweep of history, serious inflation is most often the fourth horseman of an economic apocalypse, accompanying stagnation, unemployment, and financial chaos. Think of Zimbabwe in 2008, Argentina in 1990, or Germany after the world wars. The key reason serious inflation often accompanies serious economic difficulties is straightforward: Inflation is a form of sovereign default. Paying off bonds with currency that is worth half as much as it used to be is like defaulting on half of the debt. And sovereign default happens not in boom times but when economies and governments are in trouble. Most analysts today — even those who do worry about inflation — ignore the direct link between debt, looming deficits, and inflation. "Monetarists" focus on the ties between inflation and money, and therefore worry that the Fed's recent massive increases in the money supply will unleash similarly massive inflation. The views of the Fed itself are largely "Keynesian," focusing on interest rates and the aforementioned "slack" as the drivers of inflation or deflation. The Fed's inflation "hawks" worry that the central bank will keep interest rates too low for too long and that, once inflation breaks out, it will be hard to tame. Fed "doves," meanwhile, think that the central bank can and will raise rates quickly enough should inflation occur, so that no one need worry about inflation now. All sides of the conventional inflation debate believe that the Fed can stop any inflation that breaks out. The only question in their minds is whether it actually will — or whether the fear of higher interest rates, unemployment, and political backlash will lead the Fed to let inflation get out of control. They assume that the government will always have the fiscal resources to back up any monetary policy — to, for example, issue bonds backed by tax revenues that can soak up any excess money in the economy. This assumption is explicit in today's academic theories. While the assumption of fiscal solvency may have made sense in America during most of the post-war era, the size of the government's debt and unsustainable future deficits now puts us in an unfamiliar danger zone — one beyond the realm of conventional American macroeconomic ideas. And serious inflation often comes when events overwhelm ideas — when factors that economists and policymakers do not understand or have forgotten about suddenly emerge. That is the risk we face today. To properly understand that risk, we must first understand the ideas underlying our debates about inflation. The Federal Reserve, and most academic economists who opine on policy, have an essentially Keynesian mindset. In this view, the Fed manages monetary policy by changing overnight interbank interest rates. These rates affect long-term interest rates, and then mortgage, loan, and other rates faced by consumers and business borrowers. Lower interest rates drive higher "demand," and higher demand reduces "slack" in markets. Eventually these "tighter" markets put upward pressure on prices and wages, increasing inflation. Higher rates have the opposite effect. The Fed's mission is to control interest rates to provide just the right level of demand so that the economy does not grow too quickly and cause excessive inflation, and also so that it does not grow too slowly and sink into recession. Other "shocks" — like changes in oil prices or natural disasters that affect supply or demand — can influence the "tightness" or "slack" in markets, so the Fed has to monitor these and artfully offset them. For this reason, most Fed reports and Open Market Committee statements start with lengthy descriptions of trends in the real economy. It's a tough job: Even Soviet central planners, who could never quite get the price of coffee right, did not face so daunting a task as finding just the "right" interest rate for a complex and dynamic economy like ours. The Fed describes its recent "unconventional" policy moves using this same general framework. For example, the recent "quantitative easing" in which the Fed bought long-term bonds was described as an alternative way to bring down long-term interest rates, given that short-term rates could not go down further. One serious problem with this view is that the correlation between unemployment (or other measures of economic "slack") and inflation is actually very weak. The charts below show inflation and unemployment in the United States over the past several decades. If "slack" and "tightness" drove inflation, we would see a clear, negatively sloped line: Higher inflation would correspond to lower unemployment, and vice versa. But the charts show almost no relation between inflation and unemployment. 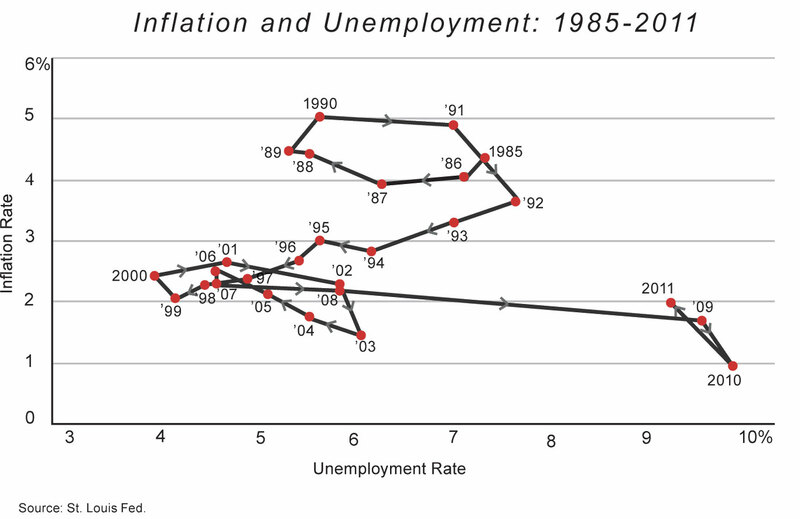 From 1992 to 2001, inflation and unemployment declined simultaneously. More alarming, from 1973 to 1975, and again from 1978 to 1981, inflation rose dramatically despite high and rising levels of unemployment and other measures of "slack." This lack of correlation should not be surprising. If inflation were associated only with booming economies, Zimbabwe — which experienced roughly 11,000,000% inflation in recent years — should be the richest country on earth. If devaluing the currency yielded stimulus and improved competitiveness, then Greece's many devaluations in the decades before it joined the euro should have made it the envy of Europe, not its basket case. Moreover, correlation is not causation. In the Fed's view, slack and tightness cause inflation and deflation. There is even less support for this view than for the idea that slack, or the lack thereof, can reliably forecast inflation. Keynesians are aware of these difficulties, of course, and they have an answer: expectations. In essence, they argue that a boomlet can occur if the public can be surprised with inflation. If people are fooled into thinking higher prices are real, they'll work harder. If people know inflation is coming, however, they will just raise prices and wages without changing their economic plans or activities. There really is a negatively sloped curve in the charts, they would argue, but an increase in expected inflation shifts the whole curve up. Since expectations are hard to measure independently, this view is hard to disprove, but that also means it is hard to use for anything more than storytelling after the fact. 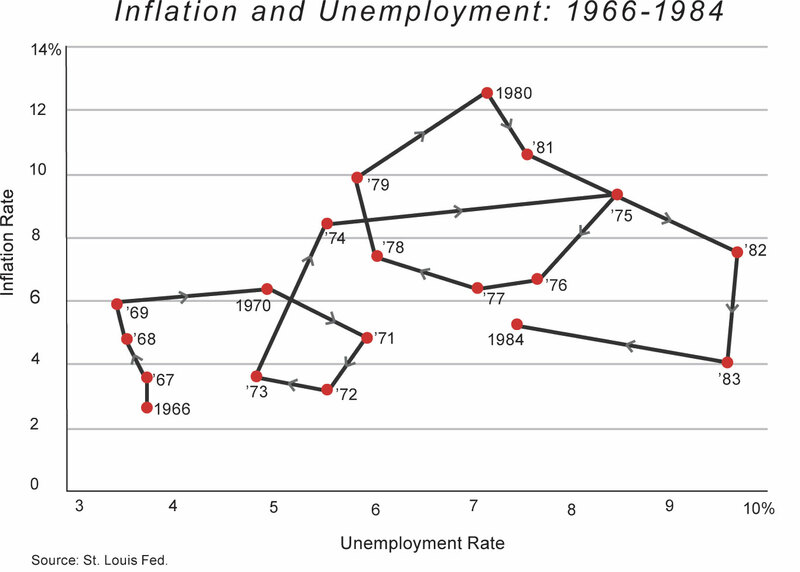 In this analysis, the stagflations of 1973-75 and 1978-81 represented increases in expected inflation, while the decline in inflation from the 1980s to 2000 — which occurred without substantial increases in unemployment — represented a Fed victory in convincing people that they should expect lower inflation. Reasons to expect inflation to moderate include the apparent stabilization in the prices of oil and other commodities, which is already showing through to retail gasoline and food prices; the still-substantial slack in U.S. labor and product markets, which has made it difficult for workers to obtain wage gains and for firms to pass through their higher costs; and the stability of longer-term inflation expectations, as measured by surveys of households, the forecasts of professional private-sector economists, and financial market indicators. To Bernanke, costs, slack, and expectations drive inflation — and not the money supply, or the national debt. In this view, monitoring the "stability" of long-term expectations is vital, as is making sure that expectations stay "anchored." We do not want people to respond to little blips of inflation with a fear that long-term inflation is about to break out. So how does the Fed know whether expectations are stable? The central bank's more extensive reports mirror the logic of the quote above: They point to surveys, forecasts, and low long-term interest rates. But the trouble is that surveys, forecasts, and long-term interest rates did not anticipate the inflation of the 1970s. 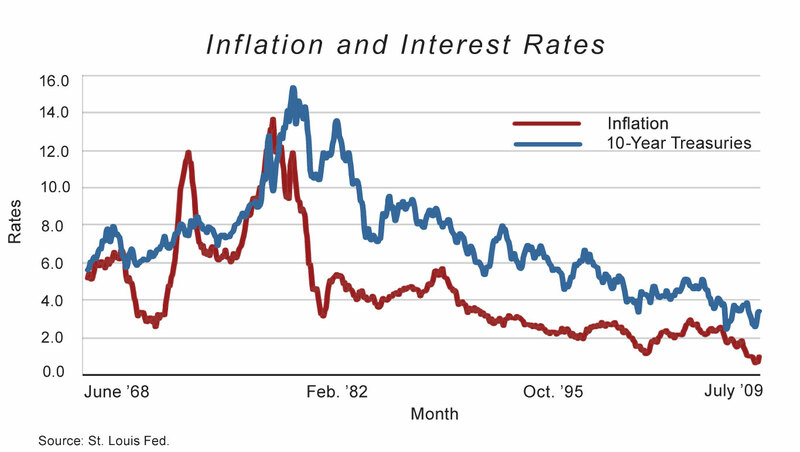 For example, the chart below plots the interest rate on ten-year Treasury notes and the inflation rate over the past four decades. If long-term interest rates offered reliable warnings of inflation, we would see the interest rates rise before increases in inflation. That does not happen. Apparently "anchors" can get unstuck quickly, and inflation can surprise the bond market as well as the Fed. Therefore, to trust that stagflation will not break out, we need some understanding of why expectations might be "anchored." As many academic economists and Fed officials see it, the "anchor" is a belief in the Fed's fundamental toughness and commitment to fighting inflation. Today, in this view, people believe that the Fed will respond to any meaningful inflation by raising interest rates much more quickly and dramatically than it did in the 1970s — no matter how high unemployment is, or how loudly Congress and the president scream that the Fed is throttling the economy with tight money, or how much the "credit constraint" and "save the banks" crowds insist that the Fed is killing the banking system, or how many "temporary factors," "cost shocks," or other excuses analysts can come up with to explain away emerging inflation. Expectations are even more central in the "New Keynesian" theories popular among academics and central-bank research staffs around the world. These theories hold that the Fed's announcement of its inflation target should by itself be enough to "coordinate expectations," and force the economy to jump to one of many possible "multiple equilibria." This line of academic theory is making its way into policy analysis. For example, International Monetary Fund chief economist Olivier Blanchard recommended last year that the Fed induce some more inflation in order to stimulate the economy, and argued that, to do so, the Fed needed simply to announce a higher target. This view also helps to explain the Fed's growing commitment to communicating its intentions. For example, the Fed's major "stimulative" action over the summer was its announcement that interest rates would stay low for a long time in the future; it did not make any concrete policy move. This view is in many ways reminiscent of the "wage-price spiral" thinking of the 1940s, or even the "Whip Inflation Now" buttons that Ford-administration officials used to wear on their lapels. If we just talk about lower inflation, lower inflation will happen. But are inflation expectations really "anchored" because everyone thinks the Fed is full of hawks who will raise rates dramatically at the first sign of inflation? Does the average person really pay any attention to Fed promises and targets, so that inflation expectations will "coordinate" toward whatever the Fed wants them to be? Yet if neither a widespread belief in the Fed's toughness nor the "coordinating" action of the Fed's pronouncements is the key to the stable expectations we have seen for the past 20 years, what does explain them? One plausible answer is reasonably sound fiscal policy, which is the central precondition for stable inflation. Major explosions of inflation around the world have ultimately resulted from fiscal problems, and it is hard to think of a fiscally sound country that has ever experienced a major inflation. So long as the government's fiscal house is in order, people will naturally assume that the central bank should be able to stop a small uptick in inflation. Conversely, when the government's finances are in disarray, expectations can become "unanchored" very quickly. But this link between fiscal and monetary expectations is too often unacknowledged in our conventional inflation debates — and it's not only the Keynesians who ignore it. For 50 years, monetarism has been the foremost alternative to Keynesianism as a means of understanding inflation. Monetarists think inflation results from too much money chasing too few goods, rather than from interest rates, demand, and the slack or tightness of markets. Monetarists today have plenty of reason to worry, as the money supply has been ballooning. Before the 2008 financial crisis, banks held about $50 billion in required reserves and about $6 billion in excess reserves. (Reserves are accounts that banks hold at the Fed; they are the most important component of the money supply, and the one most directly controlled by the Fed.) Today, these reserves amount to $1.6 trillion. The monetary base, which includes these reserves plus cash, has more than doubled in the past three years as a result of the Federal Reserve's attempts to respond to the financial crisis and recession. Get ready for inflation and higher interest rates . . . The unprecedented expansion of the money supply could make the '70s look benign . . . . We can expect rapidly rising prices and much, much higher interest rates over the next four or five years . . . .
We have all these excess reserves sitting in the banking system, a trillion-plus excess reserves . . . . As long as [the excess reserves] are just sitting there, they are only the fuel for inflation, they are not actually causing inflation . . . if they flow out too rapidly, we will potentially face some serious inflationary pressures. While I also worry about inflation, I do not think that the money supply is the source of the danger. In fact, the correlation between inflation and the money stock is weak, at best. 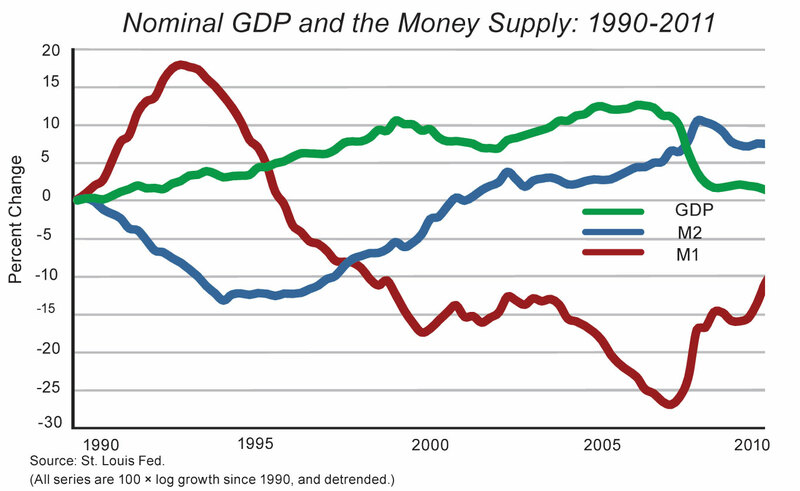 The chart below plots the two most common money-supply measures since 1990, along with changes in nominal gross domestic product. (M1 consists of cash, bank reserves, and checking accounts. M2 includes savings accounts and money-market accounts. Nominal GDP is output at current prices, which therefore includes inflation.) As the chart shows, money-stock measures are not well correlated with nominal GDP; they do not forecast changes in inflation, either. The correlation is no better than the one between unemployment and inflation. Why is the correlation between money and inflation so weak? The view that money drives inflation is fundamentally based on the assumption that the demand for money is more or less constant. But in fact, money demand varies greatly. During the recent financial crisis and recession, people and companies suddenly wanted to hold much more cash and much less of any other asset. Thus the sharp rise in M1 and M2 seen in the chart is not best understood as showing that the Fed forced money on an unwilling public. Rather, it shows people clamoring to the Fed to exchange their risky securities for money and the Fed accommodating that demand. Money demand rose for a second reason: Since the financial crisis, interest rates have been essentially zero, and the Fed has also started paying interest on bank reserves. If people and businesses can earn 10% by holding government bonds, they arrange their affairs to hold little cash. But if bonds earn the same as cash, it makes sense to keep a lot of cash or a high checking-account balance, since cash offers great liquidity and no financial cost. Fears about hoards of reserves about to be unleashed on the economy miss this basic point, as do criticisms of businesses "unpatriotically" sitting on piles of cash. Right now, holding cash makes sense.
. . . the panic demand for money has begun to and should continue to recede . . . . Reduced demand for money combined with rapid growth in money is a surefire recipe for inflation and higher interest rates. Some people have questioned whether the Federal Reserve has the tools to exit from its extraordinary positions. We do. But the question for the Fed and other central bankers is not can we do it, but will we do it at the right time and at the right pace. The Fed can instantly raise the interest rate on reserves, thereby in effect turning reserves from "cash" that pays no interest to "overnight, floating-rate government debt." And the Fed still has a huge portfolio of bonds it can quickly sell. Modern monetarists therefore concede that the Fed can undo monetary expansion and avoid inflation; they just worry about whether it will do so in time. This is an important concern. But it is far removed from a belief that the astounding rise in the money supply makes an equally astounding increase in inflation simply unavoidable. And like the Keynesians, the monetarists do not consider our deficits and debt when they think about inflation. Their formal theories, like the Keynesian ones, assume in footnotes that the government is solvent, so there is never pressure for the Fed to monetize intractable deficits. But what if our huge debt and looming deficits mean that the fiscal backing for monetary policy is about to become unglued? You don't have to visit right-wing web sites to know that our fiscal situation is dire. The Congressional Budget Office's annual Long-Term Budget Outlook is scary enough. Annual deficits are now running about $1.5 trillion, or 10% of GDP. About half of all federal spending is borrowed. By the end of 2011, federal debt held by the public will be 70% of GDP, and overall federal debt (which includes debt held in government trust funds) will be 100% of GDP. The CBO foresees a decline in deficits accompanying its prediction of a strong economic recovery, but predicts that the debt held by the public will still rise swiftly to 100% of GDP and beyond in just the coming decade. Then, as the Baby Boomers retire, health-care entitlements and Social Security obligations balloon, and debt and deficits explode. And the CBO is optimistic. In a recent paper aptly titled "Tempting Fate," Alan Auerbach (of the University of California, Berkeley) and Douglas Gale (of the Brookings Institution) project "a long-term fiscal gap of between 5 and 6 percent of GDP." Three factors make our situation even more dangerous than these grim numbers suggest. First, the debt-to-GDP ratio is a misleading statistic. Many commentators tell us that ratios below 100% are safe, and note that we survived a 140% debt-to-GDP ratio at the end of World War II. But there is no safe debt-to-GDP ratio. There is only a "safe" ratio between a country's debt and its ability to pay off that debt. If a country has strong growth, stable expenditures, a coherent tax system, and solid expectations of future budget surpluses, it can borrow heavily. In 1947, everyone understood that war expenditures had been temporary, that huge deficits would end, and that the United States had the power to pay off and grow out of its debt. None of these conditions holds today. Second, official federal debt is only part of the story. Our government has made all sorts of "off balance sheet" promises. The government has guaranteed about $5 trillion of mortgage-backed securities through Fannie Mae and Freddie Mac. The government clearly considers the big banks too important to fail, and will assume their debts should they get into trouble again, just as Europe is already bailing its banks out of losses on Greek bets. State and local governments are in trouble, as are many government and private defined-benefit pensions. The federal government is unlikely to let them fail. Each of these commitments could suddenly dump massive new debts onto the federal Treasury, and could be the trigger for the kind of "run on the dollar" explained here. Third, future deficits resulting primarily from growing entitlements are at the heart of America's problem, not current debt resulting from past spending. We could pay off a 100% debt-to-GDP ratio without inflation, at least if we returned promptly to growth and didn't rack up a whole lot more debt first. But even if the United States eliminated all of its outstanding debt today, we would still face terrible projections of future deficits. In a sense, this fact puts us in a worse situation than Ireland or Greece. Those countries have accumulated massive debts, but they would be in good shape (Ireland) or at least a stable basket case (Greece) if they could wipe out their current debts. Not us. Promised Medicare, pension, and Social Security payments (known as "unfunded liabilities") can be thought of as "debts" in the same way that promised coupon payments on government bonds are debts. To get a sense of the scope of this problem, we can try to translate the forecasts of deficits in our entitlement programs to a present value. These estimates are rough, of course, but typical numbers are $60 trillion or more — swamping our $14 trillion of actual federal debt.
. . . a growing level of federal debt would also increase the probability of a sudden fiscal crisis, during which investors would lose confidence in the government's ability to manage its budget, and the government would thereby lose its ability to borrow at affordable rates. It is possible that interest rates would rise gradually as investors' confidence declined, giving legislators advance warning of the worsening situation and sufficient time to make policy choices that could avert a crisis. But as other countries' experiences show, it is also possible that investors would lose confidence abruptly and interest rates on government debt would rise sharply. The exact point at which such a crisis might occur for the United States is unknown, in part because the ratio of federal debt to GDP is climbing into unfamiliar territory and in part because the risk of a crisis is influenced by a number of other factors, including the government's long-term budget outlook, its near-term borrowing needs, and the health of the economy. When fiscal crises do occur, they often happen during an economic downturn, which amplifies the difficulties of adjusting fiscal policy in response. The question is whether these [fiscal] adjustments will take place through a careful and deliberative process . . . or whether the needed fiscal adjustments will come as a rapid and painful response to a looming or actual fiscal crisis . . . . if government debt and deficits were actually to grow at the pace envisioned, the economic and financial effects would be severe. Neither the CBO nor Chairman Bernanke mentioned inflation in these warnings. But precisely the situation they warn about carries a significant risk of inflation amid a weakening economy — an inflation that the Fed could do little to control. To see why, start with a basic economic question: Why does paper money have any value at all? In our economy, the basic answer is that it has value because the government accepts dollars, and only dollars, in payment of taxes. The butcher takes a dollar from his customer because he needs dollars to pay his taxes. Or perhaps he needs to pay the farmer, but the farmer takes a dollar from the butcher because he needs dollars to pay his taxes. As Adam Smith wrote in The Wealth of Nations, "A prince, who should enact that a certain proportion of his taxes should be paid in a paper money of a certain kind, might thereby give a certain value to this paper money." Inflation results when the government prints more dollars than the government eventually soaks up in tax payments. If that happens, people collectively try to get rid of the extra cash. We try to buy things. But there is only so much to buy, and extra cash is like a hot potato — someone must always hold it. Therefore, in the end, we just push up prices and wages. The government can also soak up dollars by selling bonds. It does this when it wants temporarily to spend more (giving out dollars) than it raises in taxes (soaking up dollars). But government bonds are themselves only a promise to pay back more dollars in the future. At some point, the government must soak up extra dollars (beyond what people are willing to hold to make transactions) with tax revenues greater than spending — that is, by running a surplus. If not, we get inflation. If people come to believe that bonds held today will be paid off in the future by printing money rather than by running surpluses, then a large debt and looming future deficits would risk future inflation. And this is what most observers assume. In fact, however, fears of future deficits can also cause inflation today. The key reason is that our government is now funded mostly by rolling over relatively short-term debt, not by selling long-term bonds that will come due in some future time of projected budget surpluses. Half of all currently outstanding debt will mature in less than two and a half years, and a third will mature in under a year. Roughly speaking, the federal government each year must take on $6.5 trillion in new borrowing to pay off $5 trillion of maturing debt and $1.5 trillion or so in current deficits. As the government pays off maturing debt, the holders of that debt receive a lot of money. Normally, that money would be used to buy new debt. But if investors start to fear inflation, which will erode the returns from government bonds, they won't buy the new debt. Instead, they will try to buy stocks, real estate, commodities, or other assets that are less sensitive to inflation. But there are only so many real assets around, and someone has to hold the stock of money and government debt. So the prices of real assets will rise. Then, with "paper" wealth high and prospective returns on these investments declining, people will start spending more on goods and services. But there are only so many of those around, too, so the overall price level must rise. Thus, when short-term debt must be rolled over, fears of future inflation give us inflation today — and potentially quite a lot of inflation. It is worth looking at this process through the lens of present values. The real value of government debt must equal the present value of investors' expectations about the future surpluses that the government will eventually run to pay off the debt. If investors think that these surpluses will be much lower — that government will either default or inflate away, say, half of their future repayment — then the value of government debt will be only $7 trillion today, not $14 trillion. Bond holders will therefore try to sell off their debt before its value falls. If only long-term debt were outstanding, these investors could try to sell long-term debt and buy short-term debt. The price of long-term debt could fall by half (thus long-term interest rates would rise) so that the value of the debt would once again be the present value of expected surpluses. But if only short-term debt is outstanding, investors must try to buy goods and services when they sell government debt. The only way to cut the real value of government debt in half in this situation is for the price level to double. In a sense, this confirms the Keynesians' view that expectations matter, but not their view of what the sources of those expectations are. A fiscal inflation would happen today because people expect inflation in the future. A "loss of anchoring," to use a Keynesian term, would thus likely to lead to stagflation rather than to a boomlet of growth. The Treasury probably borrows using short-term bonds because short-term interest rates are lower than long-term rates. The government thus thinks it's saving us money. But long-term rates are higher for a reason: Long-term debt includes insurance against crises. It forces bondholders to bear risks otherwise borne by the government and, ultimately, by taxpayers and users of dollars. Like all insurance, a premium that seems onerous if there is no disaster can seem in retrospect to have been remarkably small if there is one. And, unfortunately, the very fact that so much of our debt is short term makes such a disaster more likely. Interest rates are very low, but they are likely to rise. An increase in interest rates could also bring on inflation today, compounding the inflationary effect of a potential debt crisis through a very similar mechanism. Just how low are today's rates? The one-year rate is now 0.2%; the ten-year rate is about 2%, and the 30-year rate is only 4%. We have not seen rates this low in the post-war era. Furthermore, inflation is still running at around 2-3%, depending on exactly what measure of inflation we choose. If an investor lends money at 0.2% and inflation is 2%, he loses 1.8% of the value of his money every year. Such low rates are therefore unlikely to last. Sooner or later, people will find better things to do with their money, and demand higher returns to hold Treasury debt. Low interest rates are partially a result of the Fed's deliberate efforts. During the past year's $600 billion "quantitative easing," the Fed essentially bought about a third of the Treasury's bond issues, in an effort to raise bond prices and thereby lower interest rates. But both the Fed's desire to keep rates this low and its ability to do so are surely temporary. Low interest rates are also partly a reflection of investors' "flight to quality," as they have sought shelter in American debt amid the financial crisis and the emerging European debt crisis. U.S. debt has long been perceived as the ultimate safe harbor: Investors believe that the United States will never default or miss an interest payment, and that surprise inflation could not eat away much of the real value of short-term debt in a year. Short-term U.S. debt is also very liquid, meaning it is easy to sell and easy to borrow against. People are willing to hold it despite low interest rates for much the same reason they are willing to hold money despite no interest rate. But this special status, too, could change. It became clear during this past summer's debt-limit negotiations that the federal government is less committed to paying interest on its debt than many observers had thought. For example, in a July breakfast with Bloomberg reporters, President Obama's chief political advisor, David Plouffe, said on the record that "the notion that we would just pay Wall Street bondholders and the Chinese government and not meet our Social Security and veterans' obligations is insanity, and is not going to happen." No administration official or congressional pronouncement has corrected or contradicted this astonishing statement. Missing interest payments would instantly mean a loss of liquidity of U.S. debt, even if the long-run budget were not an issue — which of course it very much is. The S&P ratings downgrade is only the first warning sign. A "normal" real interest rate on government debt is at least 1-2%, meaning a 4-5% one-year rate even if inflation stays at 2-3%. A loss of the special safety and liquidity discount that American debt now enjoys could add two to three percentage points. A rising risk premium would imply higher rates still. And of course, if markets started to expect inflation or actual default, rates could rise even more. Low interest rates can climb quickly and unexpectedly, as Greece and Spain have learned. A rise in interest rates can lead to current inflation in the same way a change in investor views about long-term deficits can. Every percentage point that interest rates rise means, roughly, that the U.S. government must pay $140 billion more per year on $14 trillion of debt, thus directly raising the deficit by about 10%. If we revert to a normal 5% interest rate, this means about $800 billion in extra financing costs per year — about half again the recent (and already "unsustainable") annual deficits. And this number is cumulative, as larger deficits mean more and more outstanding debt. Again, present values can help clarify the point. The rate of return that investors demand in exchange for lending money to the government is just as important to the present value of future surpluses as is the amount of future surpluses that investors expect. If investors decided they were no longer happy to earn 1% (let alone -1%) in real terms when lending to the government, then the real value of debt today would have to fall just as if investors decided that the government would inflate or default on part of the debt. And since so much debt is short term, a fall in the real value of the debt must push the price level up. These two factors — expectations of future surpluses and deficits, and increases in interest rates — are likely to reinforce each other. If bond investors decide that the government is likely to inflate or default on part of the debt, investors are likely to simultaneously demand a higher risk premium to hold the debt. The two forces will combine to apply even greater pressure toward inflation. These dynamics essentially add up to a "run" on the dollar — just like a bank run — away from American government debt. Unlike a bank run, however, it would play out in slow motion. Before the financial crisis, Bear Stearns and Lehman Brothers rolled over debt every day in order to invest in mortgage-backed securities and other long-term illiquid assets. Each day, they had to borrow new money to pay back the old money. When the market lost faith in the long-term value of their investments, the market refused to roll over the loans, and the two companies failed instantly. The United States rolls over its debt on a scale of a few years, not every day. So the "run on the dollar" would play out over a year or two rather than overnight. Furthermore, I have described for clarity a sudden one-time loss of confidence. The actual process of running from the dollar, however, is likely to take more time, much as the European debt crisis has trundled along for more than a year. In addition, because prices tend to change relatively slowly, measured inflation can take a year or two to build up after a debt crisis. Like all runs, this one would be unpredictable. After all, if people could predict that a run would happen tomorrow, then they would run today. Investors do not run when they see very bad news, but when they get the sense that everyone else is about to run. That's why there is often so little news sparking a crisis, why policymakers are likely to blame "speculators" or "contagion," why academic commentators blame "irrational" markets and "animal spirits," and why the Fed is likely to bemoan a mysterious "loss of anchoring" of "inflation expectations." For that reason, I do not claim to predict that inflation will happen, or when. This scenario is a warning, not a forecast. Extraordinarily low interest rates on long-term U.S. government bonds suggest that the overall market still has faith that the United States will figure out how to solve its problems. If markets interpreted the CBO's projections as a forecast, not a warning, a run would have already happened. And our debt and deficit problems are relatively easy to solve as a matter of economics (if less so of politics). But we are primed for this sort of run. All sides in the current political debate describe our long-term fiscal trajectory as "unsustainable." Major market players such as Pimco — which manages the world's largest mutual fund — are publicly announcing that they are getting out of U.S. Treasuries and even shorting them, as major players like Goldman Sachs famously shorted mortgage-backed securities before that crash. As with all runs, once a run on the dollar began, it would be too late to stop it. Confidence lost is hard to regain. It is not enough to convince this year's borrowers that the long-term budget problem is solved; they have to be convinced that next year's borrowers will believe the same thing. It would be far better to find ways to avert such a crisis than to be left searching for ways to recover from it. The Fed is noticeably absent from this terrifying scenario. We have come to think that central banks control inflation. In fact, the Fed's ability to control inflation is limited — and the bank would be especially impotent in the event of fiscal or "run on the dollar" inflation. The Fed's main policy tool is an "open-market operation": It can buy government bonds in return for cash, or it can sell government bonds to soak up some money. Thus, the Fed can change the composition of government debt, but not the overall quantity. Money, after all, is just a different kind of government debt, one that happens to come in small denominations and doesn't pay interest. Bank reserves, which now pay interest, are just very liquid, one-day maturity, floating-rate debt. So the Fed can affect financial affairs and ultimately the price level only when people care about the kind of government debt they hold — reserves or cash versus Treasury bills. But in the "run from the dollar" scenario, people want to get rid of all forms of government debt, including money. In that situation, there is essentially nothing the Fed can do. When there is too much debt overall, changing its composition doesn't really matter. The Fed is particularly powerless now, as short-term interest rates are essentially zero, and banks are holding $1.5 trillion of excess reserves. In this situation, money and short-term government debt are exactly the same thing. Monetary policy today is like taking away a person's red M&Ms, giving him green M&Ms, and expecting the change to affect his diet. How can the Fed be powerless? Milton Friedman said that the government can always cause inflation by essentially dropping money from helicopters. That seems sensible. But the Fed cannot, legally, drop money from helicopters. The Fed must always take back a dollar's worth of government debt for every dollar of cash it issues, and the Fed must give back a government bond for every dollar it removes from circulation. While it is easy to imagine that giving everyone a newly printed $100 bill might cause inflation, it is much less obvious that giving everyone that bill and simultaneously taking away $100 of everyone's government bonds has any effect. There is a good reason why the Fed is not allowed this most effective tool of price-level control. Writing people checks (our equivalent of dumping money from helicopters) is a fiscal operation; it counts as government spending. The opposite is taxation. In a democracy, an independent institution like a central bank cannot write checks to voters and businesses, and it cannot impose taxes. Moreover, the Fed's ability to control inflation is always conditioned on the Treasury's ability and willingness to validate the Fed's actions. If the Fed wants to slow down inflation by raising interest rates, the Treasury must raise the additional revenue needed to pay off the consequently larger payments on government debt. For instance, in the 1980s, the lowering of inflation apparently induced by monetary tightening was successful (while attempts to do the same in Latin America failed) only because the U.S. government did in fact repay bondholders at higher rates. Monetary theories in which the Fed controls the price level, including the Keynesian and monetarist views sketched above, always assume this "monetary-fiscal policy coordination." The issue we face is that this assumed fiscal balance may evaporate. The Treasury may simply not produce the needed revenue to validate monetary policy. In that case, the Federal Reserve would not be the central player. Standard theories fail because one of their central assumptions fails. Again, events outpace ideas. One might imagine a resolute central bank trying to stop fiscal inflation by saying, "We will not monetize the debt, ever. Let the rest of the government slash spending, raise taxes, or default." In that case, people might flee government debt, seeing default coming, but they would not flee the currency because they would not see inflation coming. But such behavior by our Federal Reserve seems unlikely. Imagine how the "run on the dollar" or "debt crisis" would feel to central-bank officials. They would see interest rates spiking, and Treasury auctions failing. They would see "illiquidity," "market dislocations," "market segmentation," "speculation," and "panic" in the air — all terms used to describe the 2008 crisis as it happened. The Fed doubled its balance sheet in that financial crisis, issuing money to buy assets. It bought $600 billion more of long-term debt in 2010 and 2011 in the hope of lowering interest rates by two-tenths of a percentage point. It would be amazing if the Fed did not "provide liquidity" and "stabilize markets" with massive purchases in a government-debt crisis. We may get a preview of this scenario courtesy of Europe, where the European Central Bank — responding to similar pressures — is already buying Greek, Portuguese, and Irish debt. The ECB is also lending vast amounts to banks whose main investments and collateral consist of these countries' debts. If a large sovereign-debt default were to happen, the ECB would not have assets left to buy back euros. As in the scenario described above in the context of the dollar, a "run" on the euro could thus lead to unstoppable inflation. Neither the cause of nor the solution to a run on the dollar, and its consequent inflation, would therefore be a matter of monetary policy that the Fed could do much about. Our problem is a fiscal problem — the challenge of out-of-control deficits and ballooning debt. Today's debate about inflation largely misses that problem, and therefore fails to contend with the greatest inflation danger we face. An American debt crisis and consequent stagflation do not have to happen. The solution is simple as a matter of economics. This is why all of the various fiscal and budget commissions of the past few years, regardless of which party has appointed them, have come up with the same basic answers. Our largest long-term spending problem is uncontrolled entitlements. Our entitlement programs require fundamental structural reforms, not simply promises to someday spend less money under the current system. Congressman Paul Ryan's plan to essentially turn Medicare into a system of vouchers for the purchase of private insurance is an example of the former. The annually postponed "doc fix" promise to slash Medicare reimbursement rates is an example of the latter. Ryan and the Obama administration actually project spending about the same amount of money on Medicare in the long run; the difference is that the bond markets are much more likely to be convinced by a structural change than a spreadsheet of promises. Above all, we need to return to long-term growth. Tax revenue is equal to the tax rate multiplied by income, so there is nothing like more income to raise government revenues. And small changes in growth rates imply dramatic changes in income when they compound over a few decades. Conversely, a consensus that we are entering a lost decade of no or low growth could be the disastrous budget news that pushes us to a crisis. Much of the current policy debate focuses on boosting GDP for just a year or two — the sort of thing that might (perhaps) be influenced by "stimulus" or other short-term programs. But not even in the wildest Keynesian imagination do such policies produce growth over decades. Over decades, growth comes only from more people and more productivity — more output per person. Productivity growth fundamentally comes from new ideas and their implementation in new products, businesses, and processes. This fact ought to give us comfort: We are still developing and applying computer and internet technology like mad, and biotechnology and other innovative fields have only begun to bear fruit. We are still an innovative country in an innovative global economy. We have not run out of ideas. But governments have a great capacity to stop or slow down growth. Witness Greece. Witness Cuba. Our tax rates are too high and revenues are too low. We should aim for a system that does roughly the opposite — raising the necessary tax revenue with the lowest possible tax rates, especially in those areas in which high rates create disincentives to work, save, invest, and contribute to economic growth. The disincentives implied by higher tax rates may not show up for a year or two, as it takes time to discourage growth. But when small effects cumulate over decades, they have particularly pernicious effects on growth. Regulatory and legal roadblocks can be even more damaging to growth than high tax rates, tax expenditures, and spending. The uncertain threat of a visit from the Environmental Protection Agency, National Labor Relations Board, Equal Employment Opportunity Commission, Securities and Exchange Commission, or the new Consumer Financial Protection Bureau can be a greater disincentive to hiring people and investing in a business than a simple and calculable tax. We stand at the brink of disaster. Today, we face the possibility of a debt crisis, with the consequent financial chaos and inflation, that the Fed cannot control. In order to address this danger, we have to focus on its true nature and causes. The current inflation debate, focused on tinkering with interest rates and Fed announcements, completely misses the mark. Our desire to avoid a dangerous inflation should point us in the same direction as just about every other economic indicator and concern: It should point us toward finally bringing our deficits and debt under control and spurring long-term growth. John H. Cochrane is the AQR Capital Management Distinguished Service Professor of Finance at the University of Chicago Booth School of Business, a research associate of the National Bureau of Economic Research, and an adjunct scholar at the Cato Institute.